Size: Approx 22cm / 8.6 inch. Extend chain: Approx 15cm / 5.9 inch. Necktie siz : Approx 11*4cm / 4.3*1.6 inch(L x W). Adjustable and fun decoration, fit for every fashionable girl. Perfect decor accessories in summer, cool and stylish. Make your become more gorgeous and dignity，full of personality. Consist of sparkle rhinestones, make you become the focus among crowds. 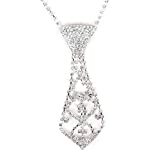 This unique necktie necklace is made of alloy and rhinestone, making you charming and become the focus among crowds. It consists of sparkle rhinestones, and the adjustable and fun decoration is fit for your baby girl. – Consist of sparkle rhinestones, make you become the focus among crowds. – Adjustable and fun decoration, fit for every fashionable girl. – Make your become more gorgeous and dignity，full of personality. This entry was posted in Wedding Store and tagged Bling, Bridal, Chain, Elegant, Jewelry, Long, Necklace, Necktie, Pendant, PIXNOR, Rhinestone, Wedding, Women by Formal Affair. Bookmark the permalink.